. @aklibetti: Districts have tremendous market power in shaping training for new teachers. Why don’t they use it? School districts are the primary consumers of new teachers, yet they have very little control over the type of teacher candidates that preparation programs produce and how they are prepared. Historically, this has meant the teachers that the programs prepare are not the teachers districts want. Surpluses and shortages are common: Preparation programs produce too many general education teachers and far too few physics teachers and teachers of color. Some states address this mismatch by requiring teacher preparation programs to work with districts to better understand their hiring needs. Indeed, some programs are contractually obligated to provide teachers in certain subject areas. But that’s not the norm. And even when these relationships exist, districts often act as if they are powerless. At the end of the day, they must fill slots to have a teacher in front of each classroom, so they rely on preparation programs to deliver teachers, even when that doesn’t work out in their favor. In reality, however, districts have tremendous market power they neither recognize nor leverage. Teacher preparation programs are beholden to districts more so than the other way around: Programs cannot offer student teaching without the cooperation of districts, and a district can ruin a program’s reputation if it publicly refuses to hire that program’s candidates. To get the right teachers in the right positions, districts must exercise that market power. Instead of passively receiving candidates, districts should clearly communicate their hiring needs, form relationships with providers that are willing to meet those needs, and sever ties with programs that don’t. In a new paper, “Trading Coursework for Classroom,” my colleague Justin Trinidad and I argue that one way school districts can do this is through teacher residencies. This work is already happening across the country. We found that Saint Paul Public Schools, for example, has partnered with Concordia University for the past two decades to recruit current non-licensed staffers of color for teaching positions. Metro Nashville Public Schools partners with the Nashville Teacher Residency to prepare first-generation college graduates, candidates of color, and district alumni to work in city classrooms. 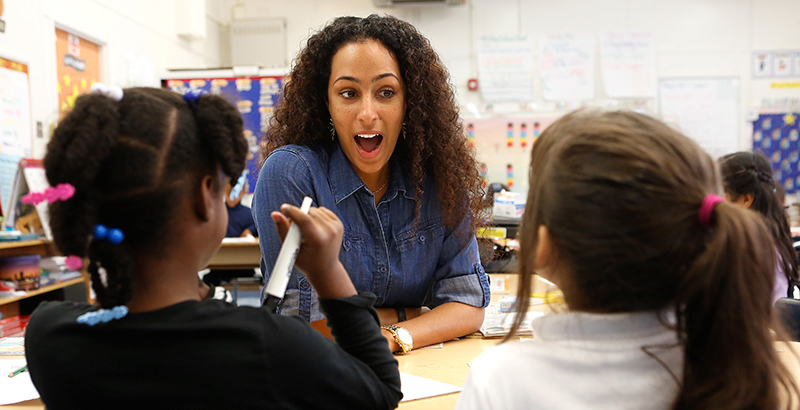 In these types of residencies, teacher candidates spend at least a year working in a district school before they can be hired as a teacher of record. Districts must agree to host candidates for that year, but they aren’t obligated to hire every candidate; the residency effectively serves as a yearlong interview. This structure gives districts more power over who comes into their schools and incentivizes residency programs to be more responsive. The best residency programs have structures and systems in place to do this, such as data-sharing agreements, regular feedback loops, and shared expectations for participants. To be sure, residency programs can’t solve all talent pipeline challenges. Residencies tend to be smaller than traditional preparation programs, so they may not be able to fill all open roles. Further, in order for a residency to be financially sustainable, districts may have to cover some of the cost of preparing candidates — often by hiring them initially as substitute teachers or paraprofessionals. Federal and state regulations may also limit the degree to which residencies can tailor their program content specifically to the district. And, crucially, districts and residencies can be aligned if only districts can articulate their hiring needs: Often, districts do not have the right data to identify their shortage areas, or if they do, the data are available too late to inform residency recruitment efforts. Even so, data suggest that residencies are more likely to produce more of the types of candidates that districts want. Studies show that teachers who enter the profession via residency programs are more likely than other teacher candidates to focus on common shortage areas, such as secondary mathematics, science, or special education. Residency graduates are also more likely to be from diverse backgrounds and stay in their positions longer once hired. Residency models offer one promising option in a toolkit of strategies that districts can use to cultivate a tailored pipeline of teachers — but their potential is currently limited. To realize the potential of teacher residencies, federal and state policymakers must shift the way that preparation programs are held accountable for their quality. In the meantime, districts can better work with residency and other preparation programs by tracking data on their hiring needs and where new hires come from, and identifying trends in performance. Additionally, districts should get comfortable with the idea that they must invest time and money to get the teachers they want. Ultimately, ensuring that all students have access to the right teachers requires districts to take control over their teacher pipelines and act like the consumers they are. Ashley LiBetti is an associate partner with Bellwether Education Partners in the policy and thought leadership practice area. Bellwether was co-founded by Andrew J. Rotherham, who sits on The 74’s board of directors. Ashley LiBetti is an associate partner with Bellwether Education Partners in the policy and thought leadership practice area.